“We are excited to expand our culinary program and offer guests new ways to experience all of the fresh produce and flavors of Baja." Esperanza, an Auberge Resort, the award-winning Relais & Châteaux property overlooking the Sea of Cortez in Cabo San Lucas, today unveiled new, invigorating culinary experiences for guests to enjoy the best of coastal Baja cuisine, including a new at-sea experience. Esperanza’s new Floating Lounge offers a dynamic event and entertainment space on the ocean for intimate gatherings complete with a DJ, dedicated cocktail and appetizer menu and watersport activities, while the resort’s new Culinary Corner, located at the resort’s casual poolside Mexican restaurant La Palapa, offers an engaging lineup of ongoing themed dining nights, including Baja Pasta Night and Mexicanismo. Esperanza also offers guests the opportunity to discover the best local spirits through its extensive beverage program that includes new craft beer tastings, vintner’s dinners and a fun way to sip and relax poolside with the help of a new margarita butler. Floating Lounge: Esperanza’s new Floating Lounge provides an ideal “scene at sea” setting for intimate gatherings and events on the Sea of Cortez. The exclusive at-sea experience for up to 25 people comes complete with private butler service, appetizer and cocktail menu, live DJ, and water activities, including stand up paddle boarding, parasailing, wave runners and snorkeling. Priced at $1,500 for three hours including décor; activities, food and beverage at additional cost. Margarita Butler - For guests renting poolside cabanas (full or half day), Esperanza offers a dedicated margarita butler who will demonstrate how to make refreshing cocktails choosing from a selection of six flavors including Tamarind-Lime “mezcalita,” ginger-grapefruit, mango-jalapeño and hibiscus-rosemary that guests can pair with salt or chili powder to rim the glass. Poolside amenities will be on hand including sunscreen, Evian mist spray and fresh towels, along with crudités, for a relaxing day of lounging. The margarita butler service is included in the cabana rental fee; each cabana guest receives two complimentary margaritas. Baja Craft Beer Tasting - Esperanza’s tequila and beer expert highlights the best local brews with craft beer tastings at Pesca Ceviche Bar. The experience pairs four artisanal beers from Mexico with an appetizer such as pilsner beer paired with duck-breast crispy tostada, porter beer with Baja shrimp tacos or red lager beer with fish battered tacos. The tasting is $45USD per person and is available from 12-4 p.m.
Vintners’ Dinners - During the month of May, Esperanza plans to showcase the great wines of Chihuahua, Mexico through dedicated dinners with Encinillas Winery. The five-course dinners with pairings are available for two nights, May 26-28, and feature Encinillas’s wine maker in residence for $99 per person. Additional Vintners’ Dinners are to be announced. Taste of Cabo: Esperanza’s annual gourmet food and wine festival is back for a weekend of epicurean adventures, June 9-12, 2016, showcasing the best of coastal Baja cuisine interpreted by the resort’s newly appointed Executive Chef Guillermo Gomez. Chef Gomez will be joined by two guest chefs and brothers Kent and Kevin Rathbun, who both appeared on the Food Network’s “Iron Chef America.” Chef Kent Rathbun is the owner and head chef of restaurants Abacus and Jasper's with locations throughout Texas, and Chef Kevin Rathbun is renowned for Atlanta-based restaurants KR SteakBar, Krog Bar and Kevin Rathbun Steak. The decadent epicurean weekend includes live cooking demonstrations, fine wine, tequila tastings and cocktails under the stars, a barbeque pool party, a five-course gala dinner and more. Packages are available, starting at $3,705 for the weekend. 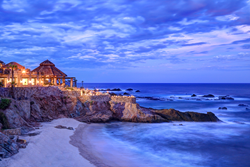 Esperanza encompasses a 57-room resort, 60 privately owned villas, 36 private residences, a full-service spa and several signature dining outlets, located on the bluffs overlooking two private coves at Punta Ballena near Cabo San Lucas. The resort recently unveiled a comprehensive revitalization that featured completely transformed guest rooms, a revitalized Cocina del Mar restaurant and Lounge Bar, new Pesca ceviche bar, enhanced pool and terrace with new cozy lounge spaces and cabanas and refreshed spa and public spaces. For reservations or more information, please call toll-free 866-311-2226 or visit esperanza.aubergeresorts.com. Follow Esperanza on Facebook at facebook.com/EsperanzaResort and on Twitter at @EsperanzaResort. Auberge Resorts Collection owns and operates a portfolio of exceptional hotels, resorts, residences and private clubs under two distinct brands: Auberge Hotels and Resorts, timeless luxury properties acclaimed for their intimate, understated elegance, and VieVage Hotels and Resorts, a new lifestyle brand that brings together contemporary themes of design, community and wellness in a fresh, active and social environment. While Auberge nurtures the individuality of each property, all share a crafted approach to luxury that is expressed through captivating design, exceptional cuisine and spas, and gracious yet unobtrusive service. Properties in the Auberge Resorts Collection include: Auberge du Soleil and Calistoga Ranch, Napa Valley, Calif.; Esperanza, Cabo San Lucas, Mexico; Hotel Jerome, Aspen, Colo.; Malliouhana, Anguilla; Nanuku, Fiji; The Auberge Residences at Element 52, Telluride, Colo.; Hacienda AltaGracia, Pérez Zeledón, Costa Rica; VieVage, Napa Valley; VieVage, Los Cabos; and Auberge Beach Residences and Spa Fort Lauderdale, with several others in development. For more information about Auberge Resorts Collection, please visit https://aubergeresorts.com. Follow Auberge Resorts Collection on Facebook at facebook.com/AubergeResorts and on Twitter at @AubergeResorts.